Version 1.1 of this Solution Accelerator, now available, updates both the guide and tool to reflect the additional functionalities provided by Windows 7 Enterprise and Windows Server 2012 R2. Launch the download for the Infrastructure Planning and Design assessment guide and scenario selection tool for Windows Optimized Desktop Scenarios v1.1. Visit the Download Center to select other guides in the Infrastructure Planning and Design Guide series. WODS is now a part of the new Windows Optimized Desktop Toolkit 2010! Learn about the toolkit. The Windows Optimized Desktop Scenarios relate the business requirements (IT and user) for a flexible, efficient, and managed desktop environment to sets of complementary Microsoft technologies by defining and using five standard user scenarios that map business requirements to technology solutions. These core scenarios are: Office Worker, Mobile Worker, Task Worker, Contract/Offshore Worker, and workers who need to Access from Home. Step 1: Understand the Windows Optimized Desktop Scenarios. 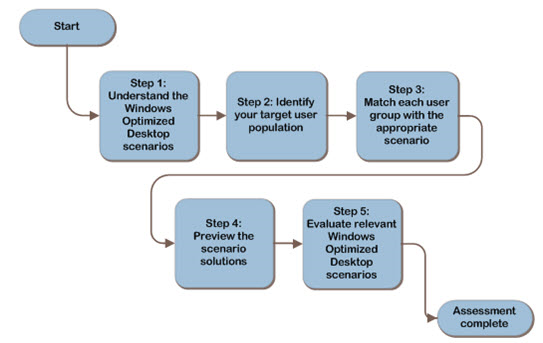 This step describes each of the scenarios from a user and IT perspective to provide context for use of the Windows Optimized Desktop Scenario Selection Tool. Step 2: Identify Your Target User Population. This step involves determining which parts of the organization’s environment to include in the infrastructure design, and establishing the objectives of the project. Step 3: Match Each User Group With the Appropriate Scenario. This step involves the process of matching user groups with scenarios. Step 4: Preview the Scenario Solutions. This section illustrates the integrated technology solutions by mapping the scenarios to individual products and technologies. Step 5: Evaluate Relevant Windows Optimized Desktop Scenarios. This step involves evaluating the solutions for the scenarios that apply to your organization. The Windows Optimized Desktop Scenario Assessment Guide describes the five user scenarios defined for the Windows Optimized Desktop and further describes the Microsoft products and technologies that underpin each scenario solution. These include: Windows 7, Windows Server 2008 R2, App-V, MED-V, Hyper-V, and Remote Desktop Services. This document guides you through an assessment of user groups in your organization to identify the scenario or scenarios that best fit your environment. The following chart maps the optimized desktop scenarios to the underlying Microsoft technologies that address their requirements. Please send questions or comments about this Solution Accelerator to mailto:satfdbk@microsoft.com?subject=Windows%20Optimized%20Desktop%20Scenarios.